You can’t keep blaming yourself. Just blame yourself once, and move on. One thing you don’t have to think about in England is frost heave. 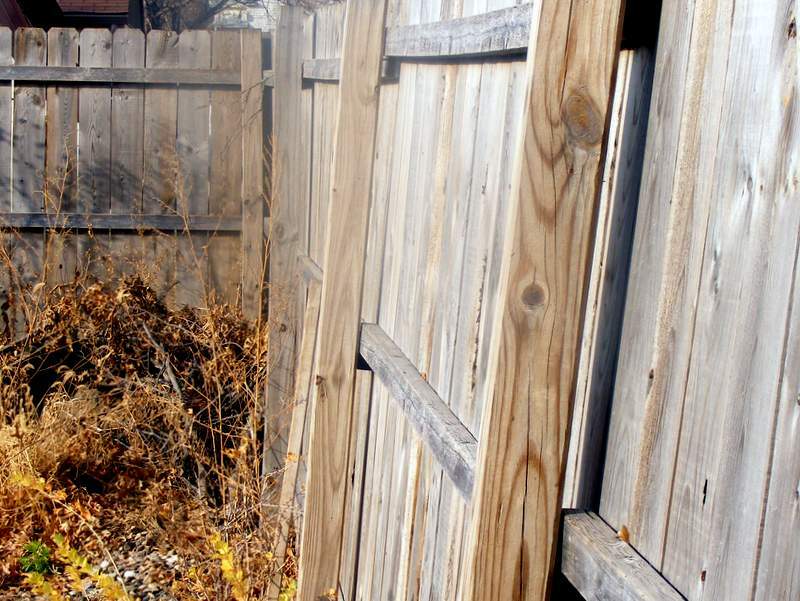 So, when we built our privacy fence, I didn’t! I sunk the 8′ posts 2′ deep, as I’d been taught. I didn’t know that bottom of the post hole should be below the frost line. In fact, I didn’t know what a frost line was. It is, of course, the depth to which the ground freezes in winter. If you don’t take this into account when setting fence posts, they will be pushed out of the ground by frost heave. Frost heave happens when soil moisture freezes and expands. If the soil freezes below the post, expansion will push the post upwards. When the ground thaws, it goes back to normal. But, repeated cycles of heave can loosen the posts and cause the fence to lean, as you can see below. Fence posts that are leaning because of frost heave. Recently, I was helping the neighbors to replace their fence, which also borders our yard. They bought the materials, and I did the work. This time, I did some research on combating frost heave. The Minnesota governement states that the maximum frost depth in the southern part of Minnesota is 3’6″. So, that’s what I went with. Whereas before, I had used 8′ posts and buried them 2′ deep. This time, I used 10′ posts and buried them at least 3’6″. Figure 1. 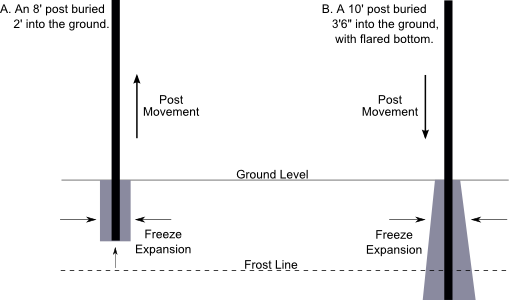 Diagram of fence posts sunk into the ground and surrounded by concrete, indicating the effects of frost heave. Another tip that I learned from the U of M was to flare out the bottom of the post hole, as shown in part B of Figure 1. Do this by chiseling the sides of the hole with a long pry bar. With a hole of this shape, sideways squeezing pressure from expanding soil moisture exerts a downward pressure on the post footings, further reducing the effects of heaving. So, it might take a bit more work to sink those posts, but I think it’s well worth the extra effort. Especially since I’m now faced with the prospect of replanting my original fence posts. D’oh! This entry was posted in American vs English, D'oh!, Outdoor Building Projects, Yard & Garden and tagged avoiding frost heave on fence posts, D'oh!, fence, fence posts and frost line, garden, how to install fence posts in cold climate, posts, winter and fence posts, yard. Bookmark the permalink.